Last week COP18 ended in Doha, Qatar. As always, the United Nations Framework Convention on Climate Change (UNFCCC) has failed in addressing the climate crisis. 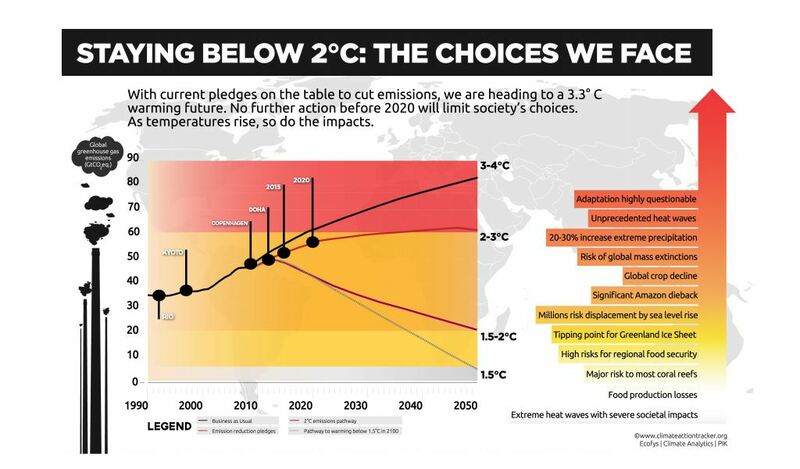 With the various commitments made there, we are on our way to warming our planet by more than three degrees (see below) whereas 2°C – and sometimes even a mere 1.5°C – is seen as the utter maximum to safety. This sharply contrasts with the various recent calls for action made by no less than the World Bank, the IEA and the United Nations. This summit clearly shows once again they are not the right solution. I am wondering if the UNFCCC is any good at all. Between Sandy the Frankenstorm which hit the first economic power with a $100 billion blow and the catastrophic typhoon that was taking place in the Philippines as leaders gathered in Doha, it’s not as if we lacked reasons for action (and concern). The eight-year extension of the Kyoto Protocol beyond 2012 keeps it alive as the sole legally binding plan for combating global warming. But it was sapped by the withdrawal of Russia, Japan and Canada, so its signatories now account for only 15 percent of global greenhouse emisions. It’s not an ” exeunt omnes “ but losing these three countries – which are accounting for around 12% of global emissions – is a series of major blow to the viability and credibility of the Kyoto Protocol. Now all but the European Union – which accounts for around 14 percent of global emissions – and a few countries accounting for a couple of percent more, are trying to cut their greenhouse gases pollution. The second and last positive point of that summit is that the European Union is more and more considering increasing its effort and slashing its emissions – just as I have reported a few days ago. This is perhaps why every single source I have had a look at is deeply dissatisfied at the results. In France, both Les Echos and le Monde are negative regarding the insufficient outcomes. While climate change progresses, negotiations have widened from mitgation to adaptation to compensating loss and damage. Equivalent to: While bathtub is overflowing, negotiations have widened from closing the faucet to mopping up the water to compensating the neighbors. In the meantime we’re opening the faucet further and further: emissions are still increasing every year. Not smart. Meanwhile, extreme weather events will continue to increase in intensity, death tolls will continue to rise and economic damages will continue to explode.